I am a PhD student in the Geography Department and a member of the Migration Research Unit (MRU). My work focusses on the relationship between migration and development, specifically looking at the impact of remittances on recipient households. Geographically, my research is interested in the Myanmar-Singapore migration corridor and aims to trace remittances from individual migrant practices, through financial intermediaries, and finally their incorporation into household livelihoods in Yangon, Myanmar. Myanmar, at various points in its post-independence history, has been referred to as the ‘hermit kingdom’, a term more contemporaneously associated with North Korea. However, beginning in the early 2010s, a raft of reforms was passed by the quasi-civilian Thein Sein administration that saw a thawing of international relations and a new era of political and economic cooperation. This was capped off by the resounding victory of the National League for Democracy, headed by the charismatic Daw Aung San Suu Kyi, in the 2015 elections. The results of this transformation have been dramatic. In 2016, Myanmar was the fastest growing economy in the world, spurred on by one of the world’s fastest developing telecoms market. Overseas economic sanctions, most notably from the US, have been lifted and there appears to be promising signs of increasing cooperation and integration within the ASEAN. Though the reputation of Myanmar – and perhaps more problematically, Daw Suu – has somewhat been marred in recent months by the ongoing conflicts in the Rakhine, there is an enduring optimism within Myanmar about the country’s political and economic future. Put simply, there is no going back. Against this backdrop, however, Myanmar also faces challenges pertaining to managing and governing its vast overseas population; it is estimated that up to 10% of Myanmar’s 53m population is overseas. The bulk of these migrants can be found in Thailand, where up to 3 nationals live and work. Elsewhere, around 250,000 can be found in Malaysia, 200,000 in Bangladesh (this is problematic owing to refugee cross-border movements), 200,000 in Saudi Arabia, and roughly 200,000 in Singapore. Within the context of labour migration, these countries are vital sources of migrant remittances, upon which everyday Burmese livelihoods have come to depend. Though economic reforms and growth have led to a decrease in absolute poverty in recent years, rural livelihoods remain marked by fragility and insecurity against ecological shock as well as market turbulence and inflation. Remittances have become an increasingly important means of generating and sustaining livelihoods in this regard. Despite this, migration governance is somewhat lower in the government’s list of priorities. This should not be read as an unwillingness to engage with migration issues, however. Under the military and socialist regimes of old, the government were traditionally unwilling to discuss or even acknowledge migration-related issues. Under Thein Sein’s Union Solidarity and Development Party (USDP) administration (2011-2016), however, various entities were established with international assistance to better monitor and protect migrant workers. In 2012, for example, the Migration Division was established to revise labour migration laws and to coordinate with regional labour importers to better protect workers. Similarly, the Parliamentary Committee on Local and Overseas Workers was established in 2016 to assist in collecting information pertaining to policy reform and support workers’ rights. 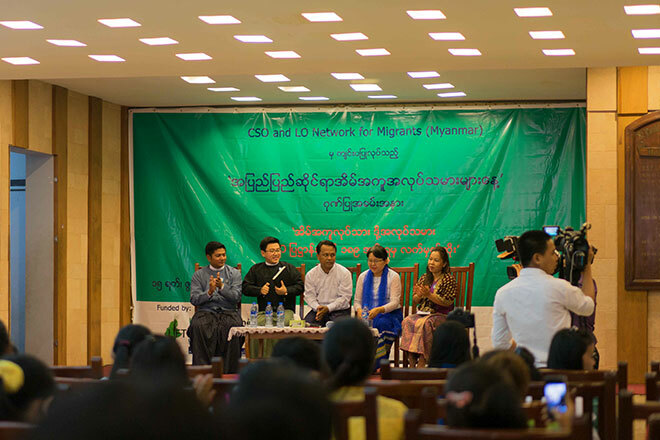 Though much work remains to be done with regards to revising and implementing effective policy, both the USDP and the NLD have shown greater willingness to engage with migrant issues and relevant international partners, especially the ILO and IOM. In recent months, the brewing instability in the Rakhine has seen international commentators grow increasingly impatient with Myanmar’s social and political progress. However, this author assets that it is unreasonable and unrealistic to expect a fledgling government to adequately juggle responsibilities between economic development, building a sustainable peace process, stabilising civilian-military affairs, and to reform and reassemble government functions. Though Myanmar’s leadership has often counselled patience with its ‘slow’ progress, its merits and achievements must also be recognised, and it is upon greater dialogue and engagement with relevant international parties that a coherent and equitable migration governance policy must be built in future.